An effective watering system only performs as well as the farmer knows how to make it. It seems like such a simple thing, but sometimes even the smallest errors can have a detrimental effect on flock performance. Not to worry, we’re here to explain everything that you need to know to make your VAL-CO watering system (or – *gasp* – another system) work as well as it can. There is a split in their hard palate so they cannot create the vacuum to swallow, so they just tilt their heads back and let water slide down their throat. Chickens have no problems drinking because of it, but they are physiologically limited to how much they can consume at a given time. 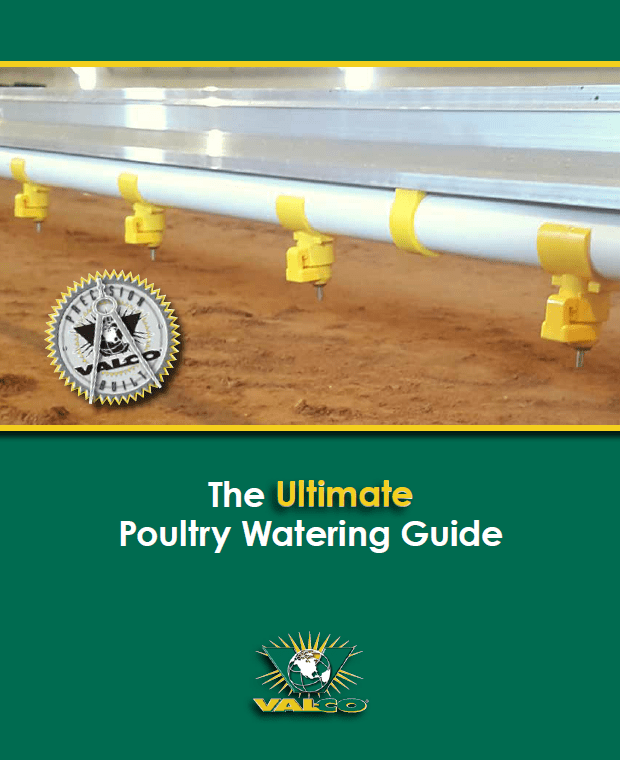 Only about one-third of the water pumped into a chicken house comes out in bird weight; the other two-thirds is either ventilated out or stuck in the litter. The key to great performance is getting as much water into the birds as possible, and this means careful maintenance, sanitation, and procedure. We’re going to walk you through flow rates and water pressure, line height and slope adjustments, and even water quality and maintenance so that you can make the most of your sanitation regimen and get the best bird performance possible.